This 1 BR Condo is a lovely, private, even romantic, GARDEN VIEW CORNER UNIT, with a good partial OCEAN VIEW. Two walls of glass look out from the living room to private, tropical gardens and to the West a partial ocean view. Lanai's are on the West and North sides surrounding the unit. It is the only true 1 BR unit at Kona Shores (separate BR). The unit is also in the most PRIVATE AREA of the complex--the northwest corner of the facility--furthest from Alii Dr. and nearest the ocean. Kitchen and Bathroom have been completely REMODELED in 2015 and 2016. Wi-Fi is provided, and there are 2 wall air conditioners; one in living room near kitchen--the 2nd in the bedroom. The OCEAN-SIDE POOL is perhaps the best for size and View along Alii Drive. Enjoy DINING at the corner of the west and north covered patios and watching green day geckos in the golden-fruited palms and plants very nearby. A little breeze keeps the 80 degree plus weather comfortable in the afternoons. Then take a dip down at the OCEAN-SIDE POOL that perches on a lava point, or walk to the sea on the concrete path along the pool to watch the sunset to the West or over Kailua pier at the other side of the Bay. This condo features a new tile entry and new tile flooring in the SEPARATE ROOM KITCHEN and bathroom. Granite counter-tops surround all sinks and provide surfaces for all cabinets. The good quality wood cabinets are new in each of the rooms. In the kitchen there is a new large refrigerator, a newer gas stove, a microwave, coffee-maker and a complete complement of kitchen utensils, plates, etc. The kitchen window looks out on the end of the West Lanai. The LIVING ROOM has two walls of glass (North and West) looking out at the private view of tropical gardens. On the North there is 6 ft. of Ginger and Palms, then 30 ft of sloping down landscaping of property next to ours. LR furniture includes a padded, rattan sofa and loveseat; a flat-screen TV, Cable TV, DVD, VCR, a closet, and shelves for books. Air conditioner, ceiling fan, and a floor fan (if needed) keep it cool in this comfortable unit. This 1st floor unit is cooler than roof-top 2nd floor units due to the extra "insulation". 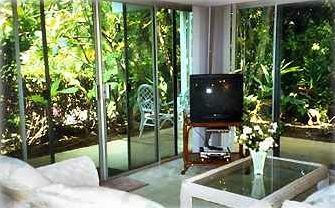 The separate Bedroom has a Cal-King bed, a chest of drawers, an air conditioner, a ceiling fan, and a GLASS WALL AND PATIO DOOR looking out on the North tropical garden area. The large Bathroom is off of the BR. It has a sink area, a new shower/tub and double closets containing linens and supplies. Note: Secondary sleeping arrangements are unusual. There is a double futon-sofa, convertible to bed, on the very private north patio between LR and BR and two single air mattresses for placement in the LR (and inflation pump) if desired. some people bring the futon mattress into the living room at night--older children or adults may sleep outside on the patio. Also, there are two thick, single Coleman air mattresses in the BR closet along with a Coleman electric pump system. These can be used for sleeping in the living room at night and stood up against a wall (behind the sofa) during the day. All linens are provided. Beach towels, mats, and ice chest are provided. The ASSIGNED parking spot is very nearby, about 6 feet below the unit where only 2 parking spots exist (the 2nd for our 2 BR 2 BA unit above). You'll have no searching for a parking spot. Laundry facilities are very nearby. This is a Non-Smoking unit and Pets are NOT allowed. The Condo is at Kona Shores, which is 1 mile south of Kailua village (and immediately south of a larger complex, Sea Village) on the OCEAN-SIDE of Alii Drive. The address is 75-6008 Alii Dr., Kailua-Kona, HI 96740. We also have a spacious 2 BR 2 BA Condo (VRBO #10605) on the same corner at Kona Shores (2 story facility); and a private Studio Condo (VRBO #10597) near this 1 BR unit in case you need more accommodations. We send you 14 pages of information on Kailua-Kona, Kona & Kohala Coasts, and the Big Island of Hawaii. Topics include sites to see; restaurants; beaches; snorkeling spots; and mention of out opinion of best activity suppliers.